"Mandela" redirects here. For ither uises, see Mandela (disambiguation). Nelson Rolihlahla Mandela (Xhosa pronunciation: [xoˈliːɬaɬa manˈdeːla]) (18 Julie 1918 − 5 December 2013) servit as Preses o Sooth Africae frae 1994 tae 1999, an wis the first Sooth African preses tae be electit in a fully representative democratic election. Mandela wis born in Mvezo, Sooth Africae tae a ryal Thembu clan. Afore his presidency, Mandela wis an anti-apartheid activist, an the leader o Umkhonto we Sizwe, the airmed weeng o the African Naitional Congress (ANC). In 1962 he wis arrestit an convictit o sabotage an ither chairges, an sentenced tae life in preeson. Mandela served 27 years in preeson, spendin mony o thir years on Robben Island. Follaein his release frae prison on 11 Februar 1990, Mandela led his pairty in the negotiations that led tae multi-racial democracy in 1994. In 1993, Mandela wis awaidit the Nobel Peace Prize wi F. W. de Klerk. As preses frae 1994 tae 1999, he frequently gae priority tae reconciliation. Mandela acame heid o the Govrenment o Naitional Unity which wis unner controllit bi the African Naitional Congress (or ANC). Mandela haed never plannit on servin a seicont term in office. Mandela gae his farwell speech on 29 Mairch 1999, efter which he retirit. In Sooth Africae, Mandela is eften kent as Madiba, an honorary teetle adoptit bi elders o Mandela's clan. Mandela deit frae buff infection in Johannesburg, agit 95. Nelson Rolihlahla Mandela wis born on Julie 18, 1918 in Mvezo, Umtata (nou Mthatha), Transkei, Sooth Africae. He wis a member o the Thembu Ryal Faimily. Mandela's faither dee'd whan he wis nine. He wis eddicatit at Fort Hare Varsity. In 1944, Mandela helpit stairt the African Naitional Congress Youth League. He wis suin a heich-rankit leader o the group. He wantit tae free Sooth Africae withoot veeolence, but the govrenment stairtit killin an hurtin protesters. He then stairtit Umkhonto we Sizwe wi Walter Sisulu an ither fowk in the African Naitional Congress that he admirit, sic as Mahatma Gandhi..
A trial wis later held an acame kent as the Rivonia Trial. Mandela wis on trial acause o his involvement in sabotage an veeolence in 1962. He wis sentencit tae life in preeson, an wis sent tae Robben Island, but wis transferrit tae Victor Verster Prison in 1988. In 1990, he wis let oot o Victor Verster Prison efter 26.5 years. He left preeson efter de Klerk removit a ban on the African Naitional Congress. He orderit Mandela's release. He then receivit the Nobel Peace Prize in 1993, wi umwhile State Preses o Sooth Africae, Frederik Willem de Klerk. Mandela won the general election in Aprile 1994. His inauguration wis in Pretoria on 10 Mey 1994. Mony fowk aroond the warld saw his inauguration on televeesion. Mandela wis the first Sooth Africaen Preses electit in a completely democratic election. Mandela acame heid o the Govrenment o Naitional Unity which wis unner controllit bi the African Naitional Congress (or ANC). Mandela haed never plannit on servin a seicont term in office. Mandela gae his farwell speech on 29 Mairch 1999, efter which he retirit. Mandela's term endit on 14 Juin 1999. Thabo Mbeki succeedit Mandela as Preses o Sooth Africae. Mandela haed been mairit three times an haes sax childer. He haed seventeen grandchilder, an a growin nummer o great-grandchilder. In Juin 2004, Mandela announcit that he wis reteerin frae public life. 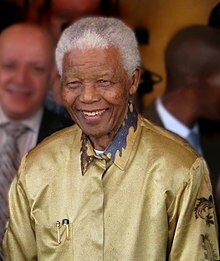 Mandela haes received mair nor 250 awairds ower fower decades, includin the 1993 Nobel Peace Prize. Mandela deit on 5 December 2013 at his home at Houghton Estate, Johannesburg frae complications o a buff infection, agit 95. He wis surroundit bi his faimily when he deit. His daith wis announcit bi Preses Jacob Zuma. He wis buiried in Qunu, Sooth Africae. ↑ "Nelson Mandela, hero of South Africa, dies at 95". ctvnews.ca. 5 December 2013. Retrieved 5 December 2013. ↑ 2.0 2.1 2.2 "African National Congress Home Page". ANC.org.za. Retrieved 21 August 2013. ↑ "Nelson Mandela Tribute". Sa-Venues.com. Retrieved 13 August 2013. ↑ "Nelson Mandela". Law2.com. Retrieved 4 July 2013. ↑ 5.0 5.1 "The Nobel Peace Prize 1993 Nelson Mandela, F.W. de Klerk". nobelprize.org. Retrieved 14 January 2011. ↑ "Mandela 'responding positively' to medical treatment". CNN.com. Retrieved 4 July 2013. ↑ "Nelson Mandel retires". World History Project. Retrieved 1 August 2013. ↑ Geoffrey York (2013-04-16). "South Africans express disgust as Mandela family members cash in on icon's name". The Globe and Mail. Retrieved 28 June 2006. ↑ Jon Jeter (17 June 1999). "In S. Africa, a President Replaces an Icon; Mbeki Takes Over From Mandela, Nation's 'Saintly Man'". The Washington Post. – via HighBeam Research (subscription required). Retrieved 3 February 2013. ↑ "'I'll call you' – Nelson Mandela". South African.info. 2 June 2004. Retrieved 10 August 2013. ↑ 11.0 11.1 "Nelson Mandela, father of a nation, dies aged 95". 5 December 2013. Retrieved 5 December 2013. Wikimedia Commons haes media relatit tae Nelson Mandela.